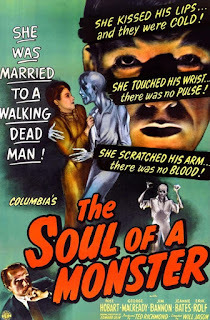 This fanciful prologue, like Columbia’s other B-movie horror Cry of the Werewolf released on the same day, prepares us ambiguously for what may or may not be believable over the next sixty-one minutes – in more ways than one. 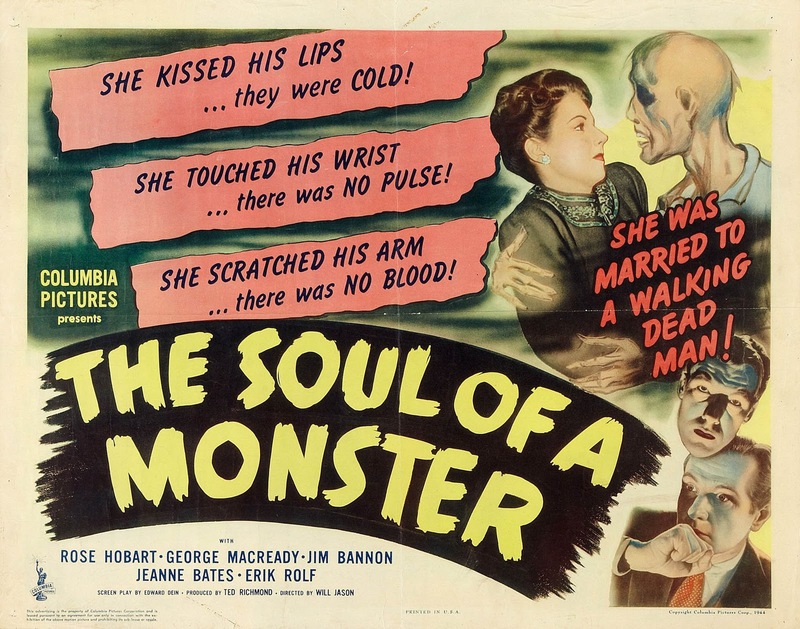 The Soul of a Monster (1944) has worthy elements in it that with more time and money could have developed into something substantial. Instead, it’s a fitfully appealing film whose deep musings struggle to emerge through the confines of a clunky script and hampering by some weak B-movie cast members. If producer Val Lewton and director Jacques Tourneur could have guided the material to their demanding and tasteful quality level, it could have overcome its limitations to become a stylishly shot and artfully written piece. Unfortunately neither Jason nor Dein are able to rise to the occasion so we must be content with hints along the way of what might have been. 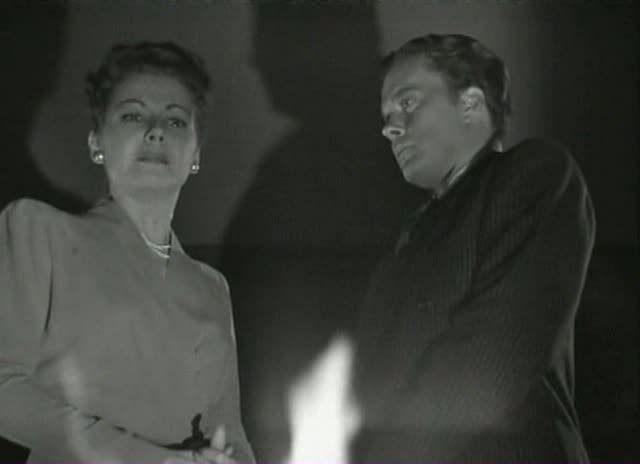 The story concerns famously altruistic surgeon Dr George Winson (George Macready), who lays prematurely dying while his devoted wife Ann (Jeanne Bates) loses her faith in bitter helplessness at a God she perceives as turning His back on such an undeserving man. Such is the potency of her love and recrimination that she stares into the fireplace’s flames and desperately invokes “If there is another power – whoever you are, wherever you are – I beg of you, save him’. 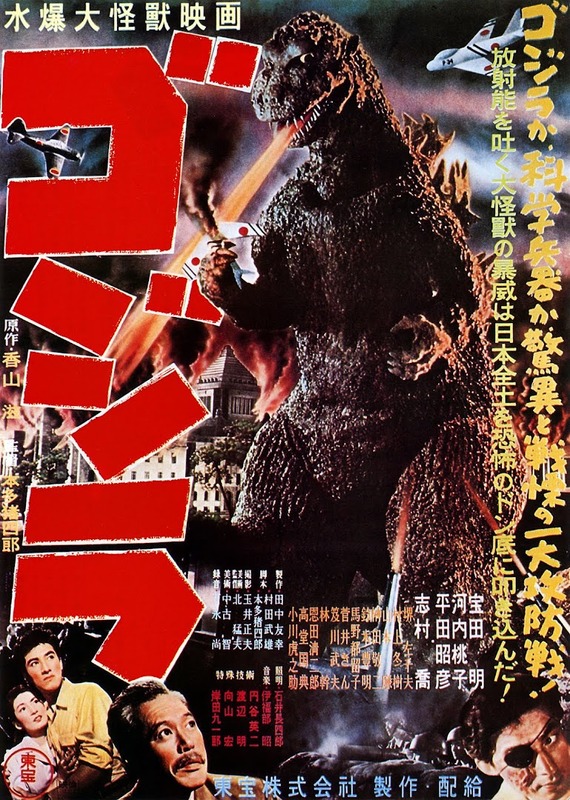 Before you can say Law of Unintended Consequences, we are treated to a bravura attempt at a strong visual set-piece that introduces our designated nemesis. A retired couple run over an unidentified woman and are mystified that she vanishes from sight. A sparking power cables dangles alarmingly down upon the street as the same enigmatic lady strides obliviously past. Two council workmen find their torches flaring all of a sudden as she passes them. Fans of Brian de Palma’s The Fury (1978) may get a pleasant little jolt of recognition from this sequence’s staging of the wake created by a supernaturally-boosted character. She arrives at the Winson home and, without so much as a proper introduction, more or less barges in and presents herself as the implied demonic representative summoned by Ann – a brusque, black-dressed, Joan Crawford-esque brunette named Lilyan (Rose Hobart). her devilishly-charged servant George (albeit on a low-performance energy trickle for the most part) revived into such unrecognisable primitivism that he kills his faithful pooch. On the side of Good we have the sympathetic, wrong-headed Ann and the couple’s friend Fred Stevens, an interesting character player named Erik Rolf. On the strength of his work here, Norwegian-parented Rolf was sadly under-parted as mainly Germans in forgettable war movies during his short life of forty-five years (though according to IMDB his versatility in New York radio drama set a staggering record of over forty separate roles in one week). Rolf gives Fred an intriguingly soulful, almost furtive depth as a hero – to the point where I would have preferred him to have swapped parts with Macready who plays George with a more routine competence than his later distinguished turns for Kubrick in Paths of Glory (1957) and Blake Edwards in 1965’s The Great Race. Wielding a knife, George pursues Fred down a dark street one night in a scene that would have been rendered a tense and memorable signature sequence under Lewton and Tourneur. However, here it extends too long and is robbed of any tension. The sole interest value comes from the frightened beat cop Fred literally bumps into (bit-part workhorse of five-hundred plus movies Harry Strang) who launches into an unlikely, biblically-slanted rant about the temptation to crime caused by dark nights: “This ain’t blasphemy, but -“. His is one of many not always subtle bids to drip-feed religious references into the script. As George looms over Fred, our hero saves his own life, unwittingly warding off his would-be killer by holding up his dropped crucifix, a fumbled resolution to an overly protracted suspense scene. The depiction of the two antagonists is even more confused when George later agrees to meet Fred in a restaurant. Somehow his homicidal stalking impulse seems to have calmed enough to be in the mood for a civilised theological debate with his old pal. Fred tries a subtle appeal to his conscience by framing George’s awful condition as though it were a story conundrum plaguing Fred: “A body without a soul would be a permanent torture. So hideous…so terrifying”, he muses. George is having none of it and storms off, leaving his loyal friend to defend his behaviour to the waiter, another purveyor of unsubtle Bible shoe-horning: “Friend? Cain and Abel were brothers!” (For an urban neighbourhood, the local church must have a pretty impressive outreach program). It isn’t only Fred who labours in vain to make himself understood; the dialogue hamstrings everyone with vagaries. Poor meddling Ann cannot work out what the devil is going on: “I don’t know what it is I’m fighting. What is this thing that’s come into our lives?” she confides in Fred. He at least symbolises the simple emollient of trusting in faith rather than the Old Testament wrath on offer around him. Meanwhile George has become a medical ambulance-chaser, almost salivating at what the siren sound brings to his operating table. “That sound…It’s stimulating”. Dr Vance not only realises his surgical colleague is running on a lean mixture, he also presents unearthly physical symptoms of having no pulse and no reaction to being stabbed with scissors. As Vance ex-stuntman Jim Bannon is wooden enough to suggest he’s overdosed on anaesthetic, which coincidentally is how George dispatches him for his suspicions. “You placed it on her shoulder, George. Only you can remove it”. Fred now has both bases covered by already urging Ann to pray for him as well. Thus, even the little Devil herself is no match for a born-again George, so full of holy inspiration that he fatally advances on her, impervious to point-blank gunshots. The epilogue, returning to George’s deathbed, does have a measure of poignancy to it. Pippa the dog and Dr Vance back at his bedside confirm the prologue hint that it was all but a dream. With a tear, George checks out but not before a lofty admonition for us to walk the path of righteousness: “We wrestle not against flesh and blood, but against principalities, against powers, against the rulers of darkness in the world…” - to be fair, a refreshing change from a sweaty detective leaning over an expired monster and saying “He’s dead”. 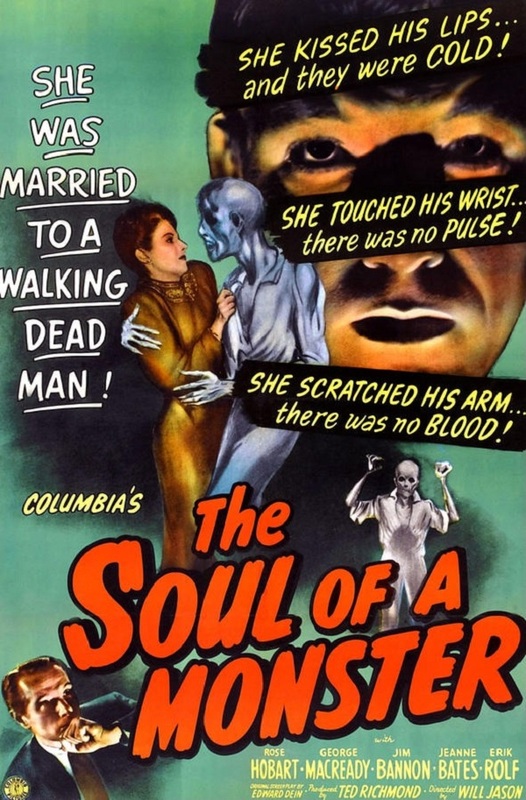 Whilst the power of religion theme is heavy-handed, The Soul of a Monster deserves credit for at least attempting nobler content than a routine horror B-movie, albeit without the resources to best support the intent.